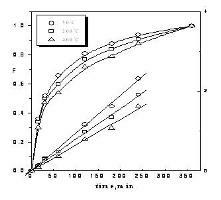 The mechanism of diffusion of Fe3+, Co2+, Cu2+, Zn2+, Cd2+, Cs+, Pb2+ and Eu3+ in the H -form of polyacrylamide Sn(IV) molybdophosphate composite as cation exchanger was studied as a function of particle size, concentration of the exchanging ions, reaction temperature, drying temperature and pH. The exchange rate was controlled by particle diffusion mechanism as a limited batch technique and is confirmed from straight lines of B versus 1/r2 plots. The values of diffusion coefficients, activation energy and entropy of activation were calculated and their significance was discussed. The data obtained have been compared with that reported for other organic and inorganic exchangers.